Seventeenth century painting of Afonso V.
Afonso V, King of Portugal KG (Portuguese pron. IPA [ɐ'fõsu]; English Alphonzo), or Affonso (Archaic Portuguese), the African (Port. o Africano), 12th king of Portugal and the Algarves was born in Sintra on January 15, 1432 and died in Lisbon in August 28, 1481. He was the oldest son of king Edward of Portugal by his wife, Infanta Eleanor of Aragon. Afonso V was only six years old when he succeeded his father in 1438. Afonso assumed the government in 1448. He conducted a successful campaign in Morocco against the Moors between 1458 and 1471. Portuguese exploration of the west coast of Africa, a project begun by Henry the Navigator, prince of Portugal, continued during his reign. During his minority, Afonso V was placed under the regency of his mother, according to a late will of his father. As both a foreigner and a woman, the queen was not a popular choice for regent. Opposition rose and the queen's only ally was Afonso, Count of Barcelos, the illegitimate half brother of Duarte I and count of Barcelos. In the following year, the Cortes (assembly of the kingdom) decided to replace the queen with Infante Pedro, Duke of Coimbra, the young king's oldest uncle. His main policies were concerned with avoiding the development of great noble houses, kingdoms inside the kingdom, and concentrating power in the person of the king. The country prospered under his rule, but not peacefully, as his laws interfered with the ambition of powerful nobles. The count of Barcelos, a personal enemy of the Duke of Coimbra (despite being half-brothers) eventually became the king's favorite uncle and began a constant struggle for power. In 1442, the king made Afonso the first Duke of Braganza. With this title and its lands, he became the most powerful man in Portugal and one of the richest men in Europe. To secure his position as regent, in 1445 Pedro gave his daughter, Isabel of Coimbra, Infanta of Portugal, in marriage to Afonso V.
Afonso V became king June 9, 1448, when he came of age, Pedro had to surrender his power. The years of conspiracy by the Duke of Braganza finally came to a head. In September 15 of the same year, Afonso V nullified all the laws and edicts approved under the regency. The situation became unstable and, in the following year, being led by what he afterwards discovered to be false representations, Afonso declared Pedro a rebel and defeated his army in the Battle of Alfarrobeira, in which both his uncle and father-in-law was killed. After this battle and the loss of one of Portugal's most remarkable infantes, the Duke of Braganza became the de facto ruler of the country. Afonso V then turned his attentions to the North of Africa. In his grandfather's (John I of Portugal) reign, Ceuta had been conquered from the king of Morocco, now the new king wanted to expand the conquests. The king's army conquered Alcacer Ceguer (1458), Tangiers (won and lost several times between 1460 and 1464) and Arzila (1471). This achievements granted the king the nickname of the African. The king also supported the exploration of the Atlantic Ocean led by prince Henry the Navigator but, after Henry's death in 1460 he did nothing to pursue this course of action. Administratively, Afonso V was an absent king, since he did not pursue development of laws or commerce, preferring to stand with the legacy of his father and grandfather. In 1452, Pope Nicholas V issued the papal bull ''Dum Diversas'', granting Afonso V the right to reduce any "Saracens, pagans and any other unbelievers" to hereditary slavery. This approval of slavery was reaffirmed and extended in the ''Romanus Pontifex'' bull of 1455 (also by Nicholas V). These papal bulls came to serve as a justification for the subsequent era of slave trade and European colonialism. So Afonso V, together with Nicholas V, became key figures in the history of slavery. When the campaigns in Africa were over, Afonso V found new grounds to battle in the Iberian Peninsula. In neighboring Castile, a huge scandal with political and dynastic implications was rising. King Henry IV of Castile was dying without heirs. From his two marriages, only a daughter, Joan, princess of Castile had been born. But her paternity was questioned, causing the divorce of her parents. She was never considered legitimate and, now that the king was dying, no one took her as a serious contender for the crown. Her aunt, Isabella I of Castile, was due to inherit the crown. But Afonso V was keen to interfere with the succession in Castile. In 1475 he married his niece Joan, the Beltraneja, whom he considered the legitimate heir to the crown. He proclaimed himself king of Castile and León and prepared to defend his wife's rights. But in the following year he was defeated at the Battle of Toro by king Ferdinand II of Aragon, the husband of Isabella of Castile. He went to France to obtain the assistance of Louis XI, but finding himself deceived by the French monarch, he returned to Portugal in 1477 with very low spirits. Disillusioned and depressed he fell into a deep melancholy and abdicated to his son Prince João (future John II). After this, he retired to a monastery in Sintra where he died in 1481. His death was mourned in the country, by the people who loved the king, and by the nobles who were starting to fear his successor. Afonso V was a direct descendant of Edward III of England through his son John of Gaunt and therefore was a direct descendant of William the Conqueror, King of England. 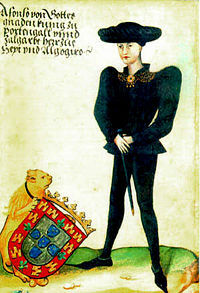 Prince João (John) January 29 1451 1451 Crown Prince of Portugal (1451). 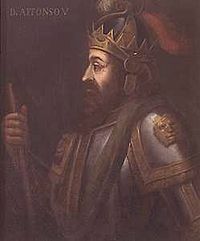 as John, 13th King of Portugal. Álvaro Soares de Carvalho c. 1467 1557 Natural son. This page was last modified on 15 February 2016, at 16:57.